Last week I shared a normal day of myself as a PhD student at Surrey. I do understand that there are far more masters students than PhD students in almost every university in the world, and there may be more people who want to know what it is like to be a masters student at Surrey. Fortunately, I got my MSc degree from Surrey as well, so I can answer the latter question as well. Today I’m gonna share my own experience as a master engineering student at Surrey. Background information: my masters programme was MSc Communications Networks and Software, which was under the Department of Electronic Engineering (currently known as Electrical and Electronic Engineering), Faculty of Engineering and Physical Sciences. As a masters student at Surrey, you are supposed to finish 8 modules during your study: 4 for each semester. There are 11 weeks in each semester, and it is highly likely you will have all the 4 modules (lectures and/or labs) every week. The time schedule is quite tight, but you get plenty of time to communicate with your lecturers. They are always willing to help you, that’s guaranteed. For labs I don’t want to talk much about this, since different subjects require different facilities, and I am only familiar with what electronic engineering students need. One thing is for sure: the university can provide all the infrastructure you will need for your study. During lab time, there will be one or more demonstrators helping you. (If you are doing communication-related modules, I may be one of your demonstrators as well.) If you do need to use the labs outside normal teaching hours, simply ask your lecturers; some of the labs are always open to students. After attending lectures and labs, now it’s time for assignments. For engineering students, your assignments may be more than essays; sometimes you need to finish a project individually or as a group, then you will be asked to produce a report or/and a presentation. The projects are usually more like the real tasks you would get in your future career, and they are certainly helpful for developing comprehensive abilities. As a student, exams are an essential part of your life. I know they could be tough sometimes, but you have to face it. The final exams usually take place in January and June, while there may be quizzes throughout the semester. Revision lectures may be provided before the final exams, based on the lecturers’ arrangements. There is no significant difference in terms of exams between engineering students and students under other programmes. I know you will not do so, but cheating is strictly prohibited. Don’t ever try to think so. After two semester’s study (~9 months), the remaining three months are for you to finish your dissertation. The dissertation of an engineering student is somehow like a report for your graduation project, which you should start doing from late semester 1. It’s very common not to have finished all the objectives in your project by the end of semester 2, but you should finish as soon as you can during the summer since you still need time for writing-up. By the way, please make a detailed time plan in advance and follow it as much as possible, the actual writing-up process always takes much longer than you imagine. Compared to masters students from the Business School, you may not have as many classmates as an engineering student; but there could be dramatic diversity. You will have a lot of opportunities to work with people from different culture and background, and it is quite a unique experience. This is a quite long post. 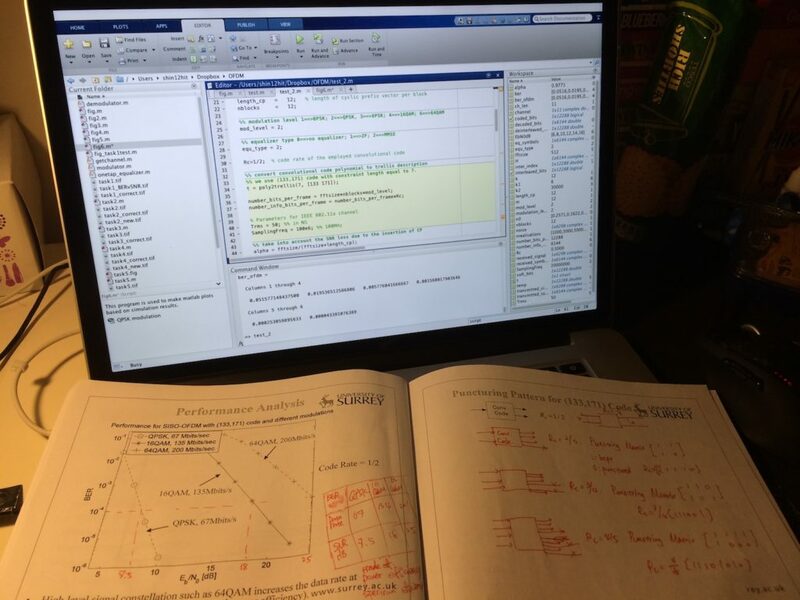 To sum up, as a masters engineering student, you will learn solid knowledge while enjoying your life at Surrey. To be honest, I did, and it was also one of the reasons that I decided to stay here for several more years. If there is anything you are interested in but I haven’t covered, please leave a comment. Hope to see you at Surrey sometime in the future!